2405 ⊙/ / German Reich - 1933 / 45, very rich collection, twice collected with plenty of better issues. With also 4 RM. Chicago travel, Wagner set, airmail 1934 twice, professions set twice, Pair of olympia souvenir sheets 1936, winter relief series, a number of Hitler souvenir sheets, Munich Riem overprint block, brown and blue ribbons, Nürnburg-race, Gdansk departure set twice, of it a set as registered cover and much further material. A magnificent object with very high catalogue value! 2408 ✉ German Reich - interesting lot of 145 package cards with frankings the Hitler issue in the ring binder, partly traces of usage, mainly in good condition. As well interesting examples, various postage steps, mixed franking combinations, multiple franking, many various places of posting and so on. A delightful lot! 2426 ⊙/ / German Reich - 1872 / 1945, rich collection in the Schaubek illustrated album. 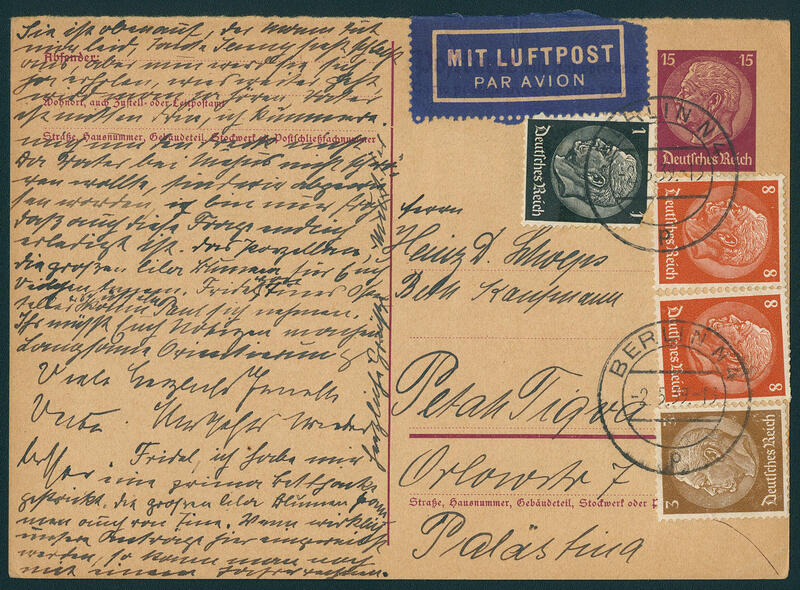 With numerous better values, including breast shield stamps, Germania-time including mark values, much inflation with numerous used issues, Weimar with airmail 1926, I. A. A. 1927, winter help work issues, Third Reich well-staffed, with also Wagner set, trade set, winter relief sets, brown and blue ribbons, Nürnburg-race and much further material including souvenir sheets as for instance olympic games souvenir sheet pair, Hitler souvenir sheets, Munich Riem overprint block with first day special cancel and subsequent another extensive part official stamps. Enormous catalog value! 2482 x German Reich - with interesting and many sided inventory, all mounted on pages, stock cards, in bags and so on. As well numerous special- and commemorative issues including better values, some souvenir sheets, Wagner set, trade set twice, Nürburgring race twice, Gdansk farewell series twice and many further better issues partly multiple. Favorable valued inventory with gigantic catalogue value, perfect for liquidation! 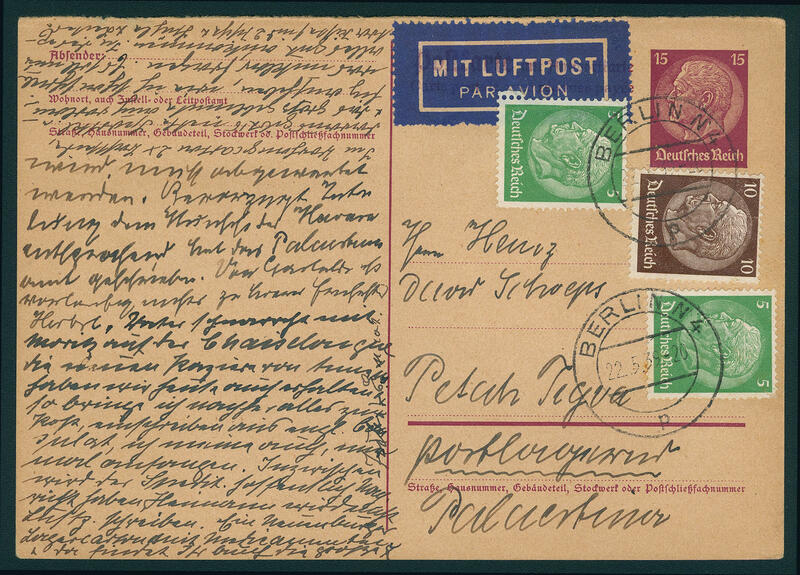 2483 ✉ German Reich - 1938 / 39, exceptional interesting and extensive collection from postal stationery 15 Pfg. 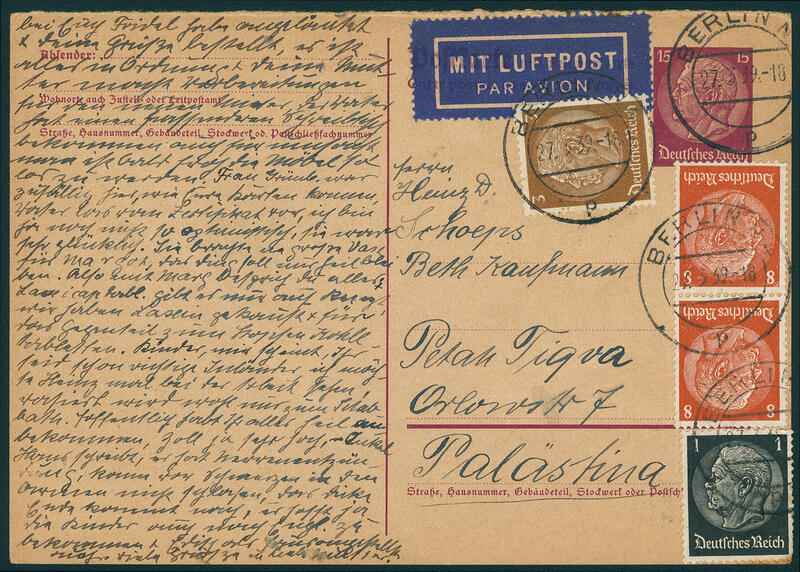 Hindenburg with additional frankings, all by airmail to Petah Tiqua / Palestine from a correspondence, mailed in Berlin respectively Hamburg. 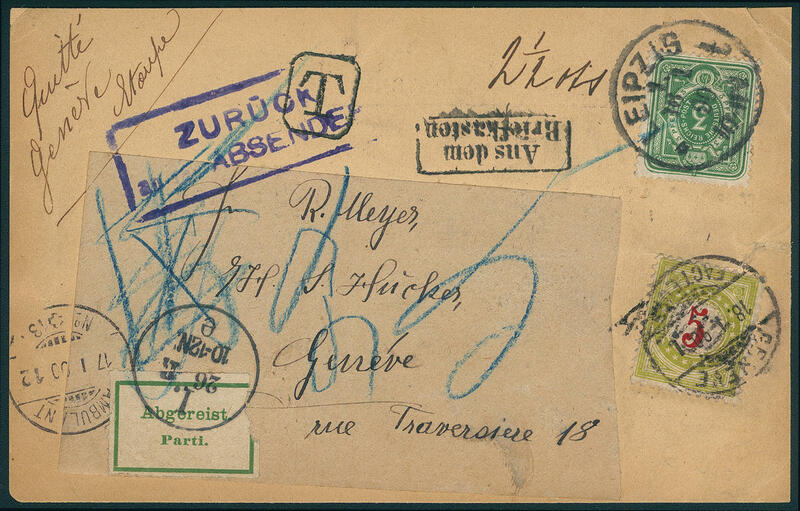 All cards with all detailed texts, often historical very attractive, partly transport traces. An extraordinary object, like it in this kind seeming to be unique might! 2484 ⊙ German Reich - 1872 / 1945, extensive collection, almost exclusively used collected in the Lighthouse illustrated album with numerous sought-after issues, as well various breast shield stamps including better issues, penny / pennies and crown / eagle, with also color shades, Germania period including mark values, numerous inflation issues, good part Weimar Republic including help in need sets, wood-pigeon 1924, airmail 1926, 1-4 RM. Zeppelin, 2 RM. 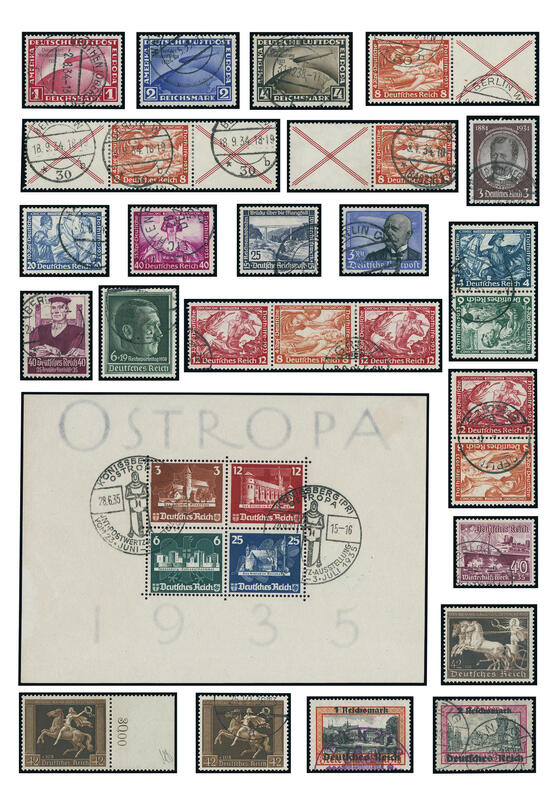 South America flight, as well much Third Reich with Wagner set, professions set, Ostropa souvenir sheet with appropriate special cancel, olympic games souvenir sheet pair with special cancel, all fours Hitler souvenir sheets, Munich Riem overprint block, brown and blue ribbons, winter relief series, Nürburgring race, Gdansk farewell series, official stamps and so on. A beautiful and extensive object with very high catalogue value! 2485 / German Reich - 1933 / 45, superb collection in the Lindner ring binder, nearly complete and with a great many mint never hinged issues. Included are also Frederick the Great, Hindenburg serie watermarked waffle, Wagner set (key value expertized Peschl BPP), Chicago travel 1933 as corner margin set, charity souvenir sheet in original size, center piece from the Ostropa souvenir sheet, olympic games souvenir sheet pair, all Hitler souvenir sheets, airmail 1934, professions set, Nürnburg-race, brown and blue ribbons, Gdansk farewell series and so on. Right up to SA / SS 1945 perforated and cut. A magnificent object with substance! 2486 ⊙/ / I, 82, 83a, 86/88 German Reich / service - rich collection the service edition from 1874 / 1942, partly multiple formed on stock pages. Also the good Michel no. I fresh colors and with wide margins with original gumming, numerous further issues, with also blocks of four, numerous inflation period issues including snake imprints, as well Michel no. 82 in the cancelled block of four expertized Infla / Berlin (Michel 800,- €), Michel no. 83 an in the cancelled pair expertized Infla / Berlin (Michel 400,- €), 84 in the cancelled block of four expertized Infla / Berlin (Michel 600,- €), Michel no. 86 / 88 used expertized Infla / Berlin (Michel 640,- €), 95 YI mint never hinged expertized Infla / Berlin (Michel 300,- €), as well numerous issues Weimar and Third Reich. Interesting object with enormous catalogue value! 2515 ⊙/✉ German Reich - 1933 / 45, a particularly beautiful and cultivated collection clean made up in two Lindner ring binder, in the number of a major listing more then complete formed. With also Chicago travel 1933, Wagner set in both perforations available, very nice part Wagner se-tenants, the charity souvenir sheet in almost complete original size on registered special delivery letter as printed matter from 100-250 Gram correctly franked franked, without arrival postmark, Ostropa souvenir sheet 1933, all further souvenir sheets, special- and commemorative sets, nice covers and so on. A magnificent object with substance! 2516 / German Reich - 1933 / 45, very nice collection Third Reich, in the number of a major listing complete with all good issues on lighthouse hingeless preprinted pages. With also Hindenburg watermark waffle, Wagner set, charity souvenir sheet Nothilfe in original size, Chicago travel 1933, airmail 1934, professions set, Ostropa souvenir sheet 1935, all further souvenir sheets, brown and blue ribbons, winter relief series, Nürnburg-race, Gdansk farewell series and so on, whereby a great many mint never hinged issues are present. A magnificent object with substance! 2517 / German Reich / se-tenants - lovely special collection se-tenants and stamp booklet panes Weimar Republic, mainly mint never hinged formed with numerous rarely issues in the Lindner hingeless ring binder. 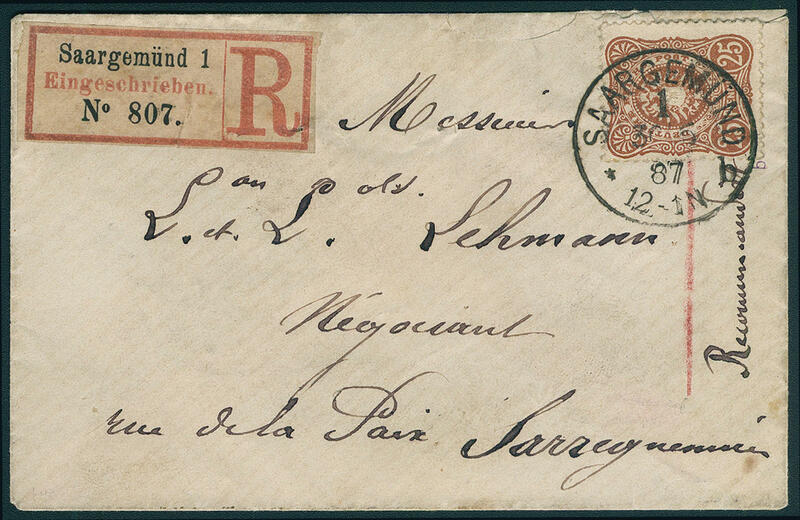 Many better combinations and scarce stamp booklet panes the help in need issues including top pieces, St. Andrews crosses, as well Presidents of the Reich and airmail. A very nice and rich object with very high catalogue value! 2518 ⊙/ / German Reich - 1872 / 1945, extensive inventory in two large thick stock books accommodated with lots of material, slightly mixed condition, with many flawless values, as well numerous breast shield stamps including better values, penny / pennies and crown / eagle including colors, shades, a very large part Germania-time including mark values, lots of inflation, Weimar with wood-pigeon 1924 (key value three times available), airmail 1926, I. A. A. 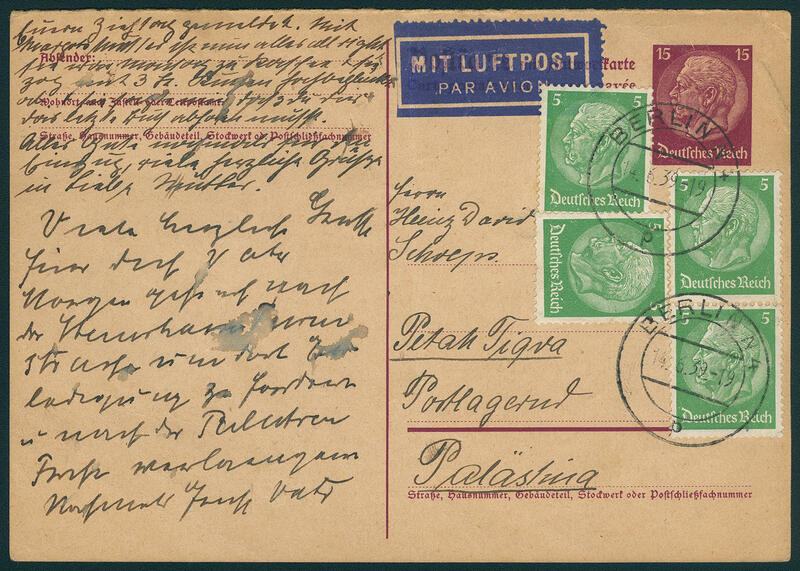 1927, help in need sets, Zeppelin stamp, as well an extensive part Third Reich with 2 RM. Chicago travel, Wagner set, professions set six times, uniform set four times, many special- and commemorative sets, winter relief sets, brown and blue ribbons, Nürnburg-race four times, Gdansk farewell series three times and so on. Perfect for liquidation, huge catalogue value! 2519 ⊙/ / 1/7, 9/14 German Reich - 1872 / 1932, rich collection in the Schaubek illustrated album with plenty of better issues, as well extensive part breast shields with Michel no. 1 / 7, 14 / 15, 16 / 23, 27 a, 29 / 30, penny / pennies and crown / eagle including color shades, Germania-time including mark values abundant be present, with also 5 Mk. 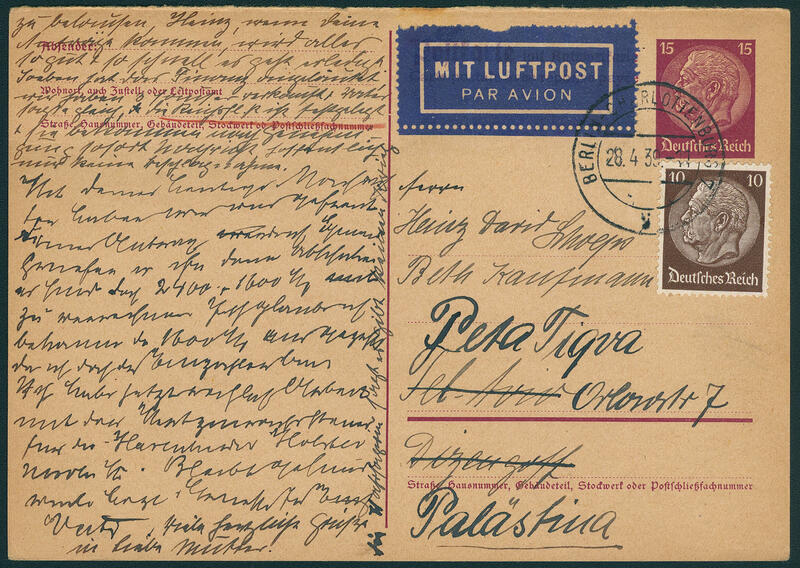 Reichspost, extensive part inflation issues, as well numerous issues Weimar Republic including airmail 1926, important German, Presidents of the Reich, I. A. A. 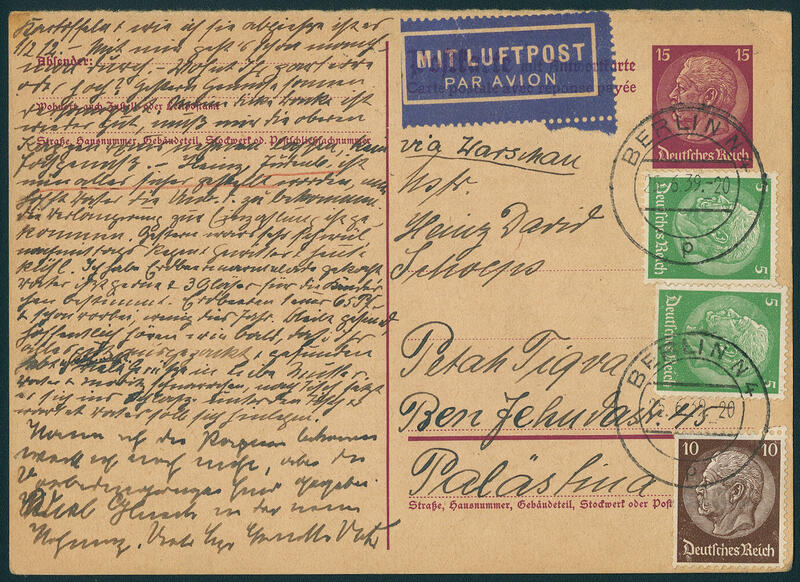 1927, various help in need sets and subsequent a good part official stamps with Michel no. 9 / 14 and so on. Favorable valued collection with enormous catalogue value! 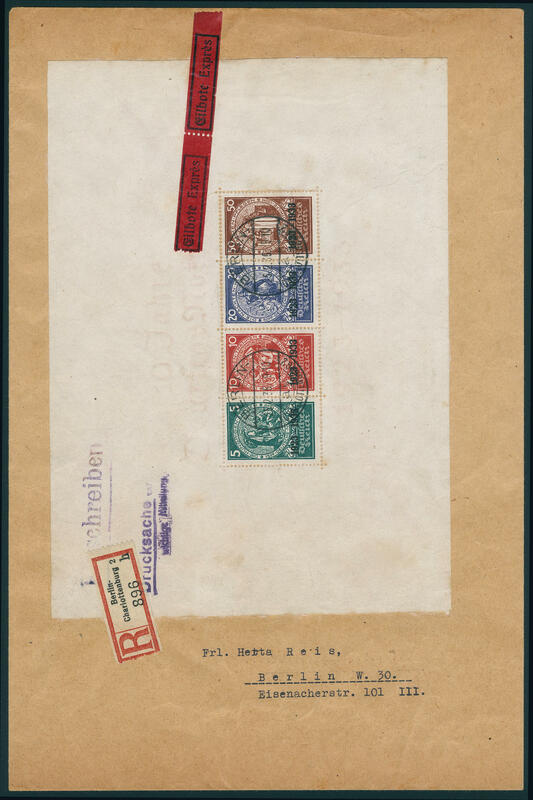 2592 ⊙/ / /✉ 39/44 German Reich - an exceptional, interesting and enormously extensive special collection of the issue \"penny\" (Michel no. 39 / 44) in the safe ring binder. As well a great many sought specialties like various colours, numerous plate flaw, gutter pairs and so on. With many extraordinary and beautiful copies, also lovely letter pieces and so on. With also Michel no. 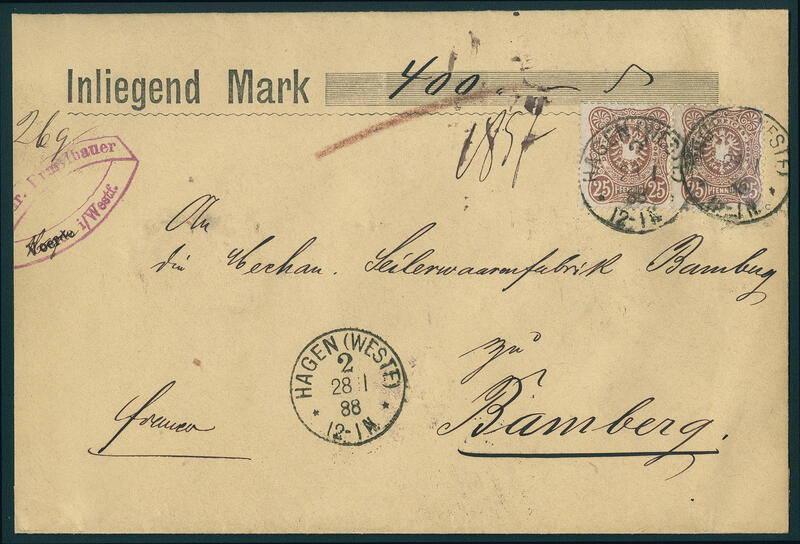 41 unperforated both as single as also in the horizontal pair with photo certificates Zenker BPP, as well numerous further popular issues. Furthermore an outstanding part covers and cards with many extraordinary documents, rarely frankings, different use form and postage steps and so on. Almost all better contained issues are with BPP examinations provided. An exception object! 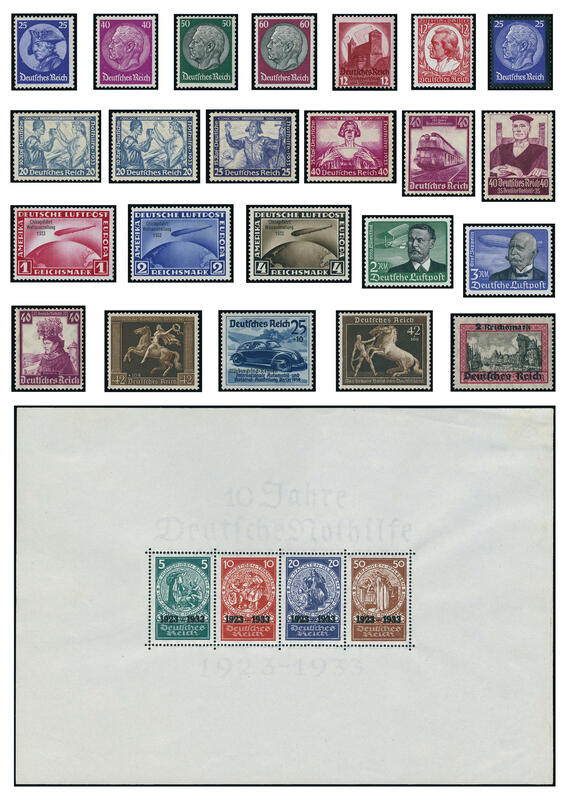 2593 / German Reich - 1933 / 45, superb collection, complete formed with all issued stamps, predominantly in mint never hinged condition in the lighthouse hingeless illustrated album. Included are also the issues Frederick the Great, Hindenburg watermarked waffle, Wagner set in both perforations complete, charity souvenir sheet Nothilfe in original size, trade set, airmail 1934, Ostropa souvenir sheet 1935, olympic games souvenir sheet pair, all Hitler souvenir sheets, brown and blue ribbons, Nürnburg-race, Gdansk farewell series and so on. A very nice and Cultivated object! 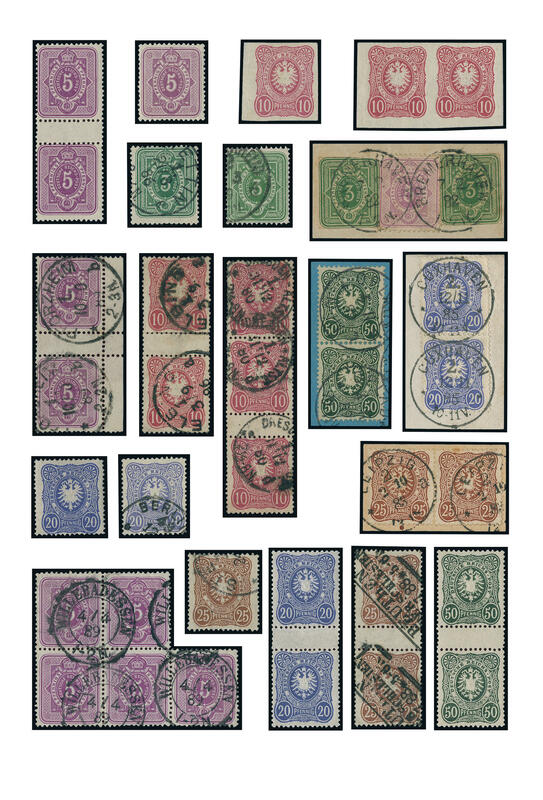 2594 ⊙/ 24, 27a, 27b German Reich - 1872 / 1923, rich collection, almost exclusively used collected with numerous good issues on KABE preprinted pages, mainly good condition. As well an interesting part breast shields with Michel no. 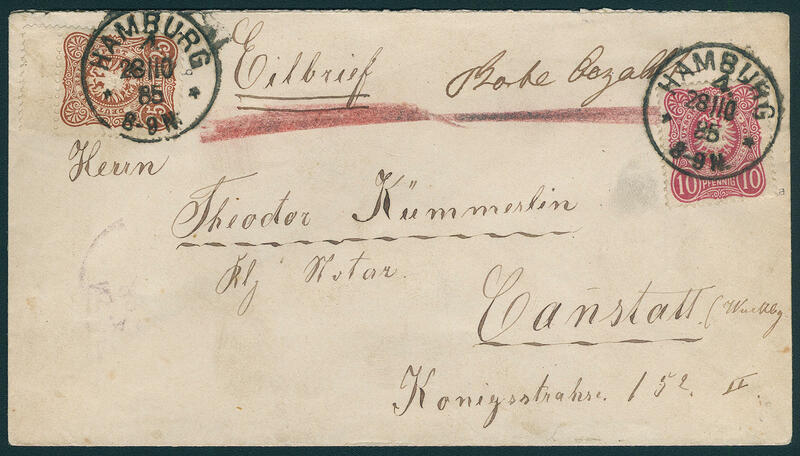 1 / 10, 12 / 13, 15, 16 / 23, the very scarce 2 Kr. 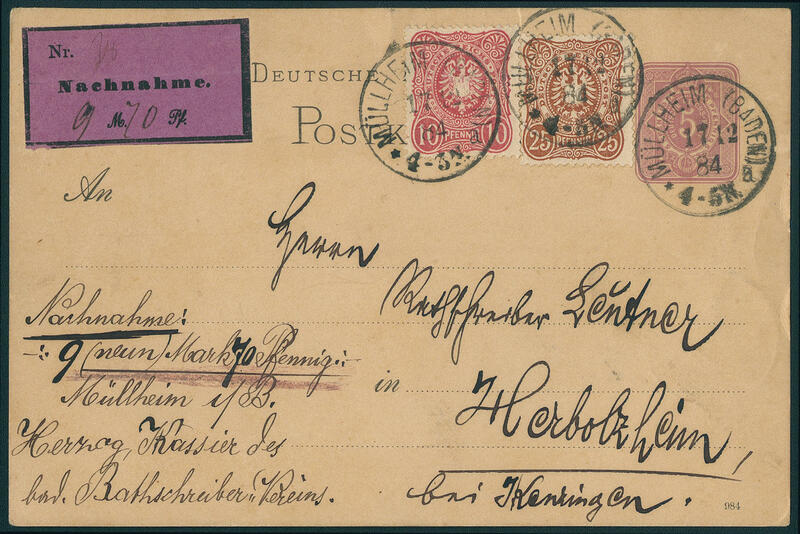 Large shield as decorative single franking on nice postcard from \"MAINZ\" to Bonn (Michel no. 24), 9 Kr. Large shield in two colours (Michel no. 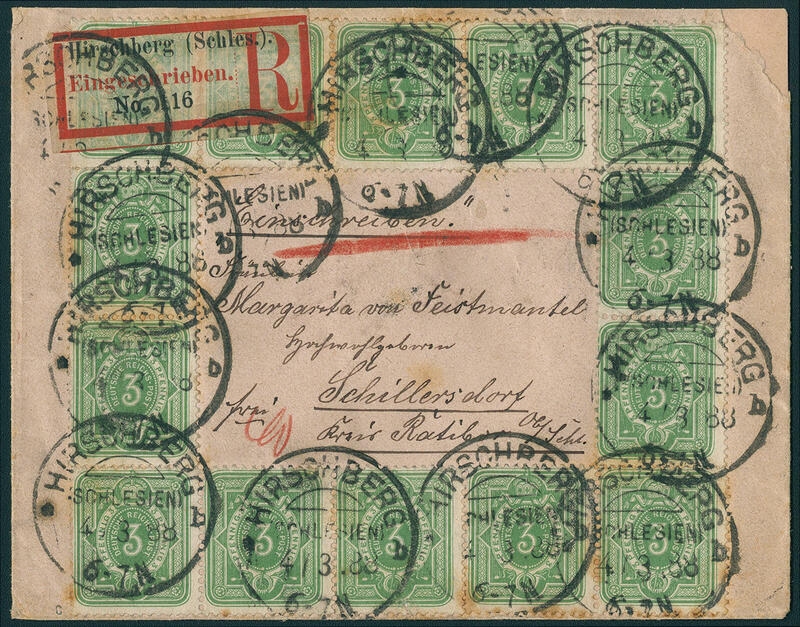 27 a, 27 b), Germania-time including mark values extensively present, with also 5 Mk. 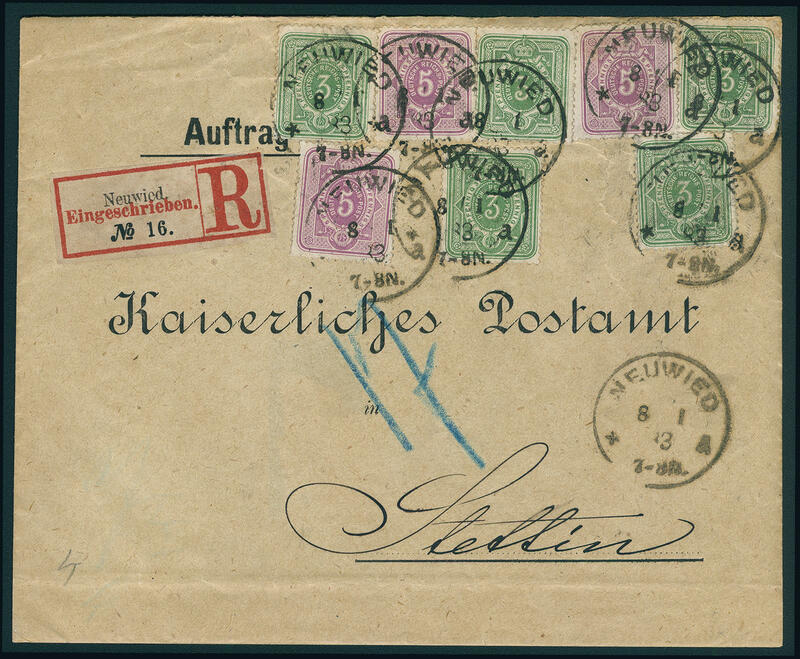 Reichspost, as well an extensive part inflation period issues. Favorable valued collection with substance and very high catalogue value! 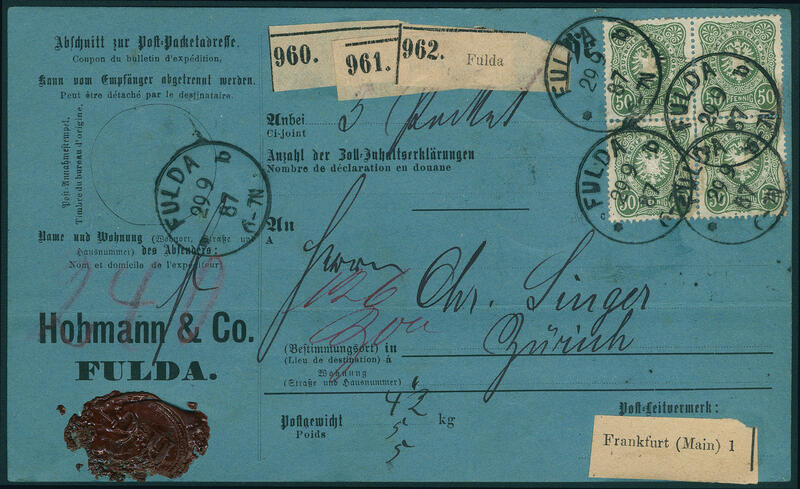 2595 /⊙ German Reich / local post - interesting and extensive collection the city postal service stamps from the years 1886 / 98 in the speaking Behrens Album formed with numerous different towns, perforated and cut issues, complete sets, overprint stamps and so on. From Altona to Zeitz. A nice collection this attractive issues. In total includes the collection over 350 values! 2596 ⊙/✉ German Reich - 1933 / 45, extensive used collection in two large stock books formed with numerous good issues, as well on covers. 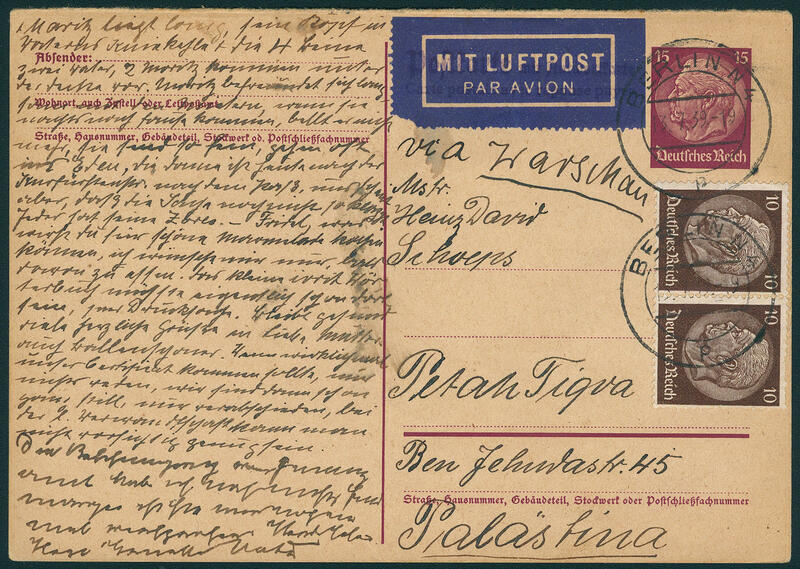 With also Chicago travel 1933, Ostropa souvenir sheet 1935 with appropriate special cancel (small faults), professions set, air mail letters, Hitler souvenir sheets, brown and blue ribbons, Nürnburg-race, nice letter pieces and so on. A magnificent object with very high catalogue value! 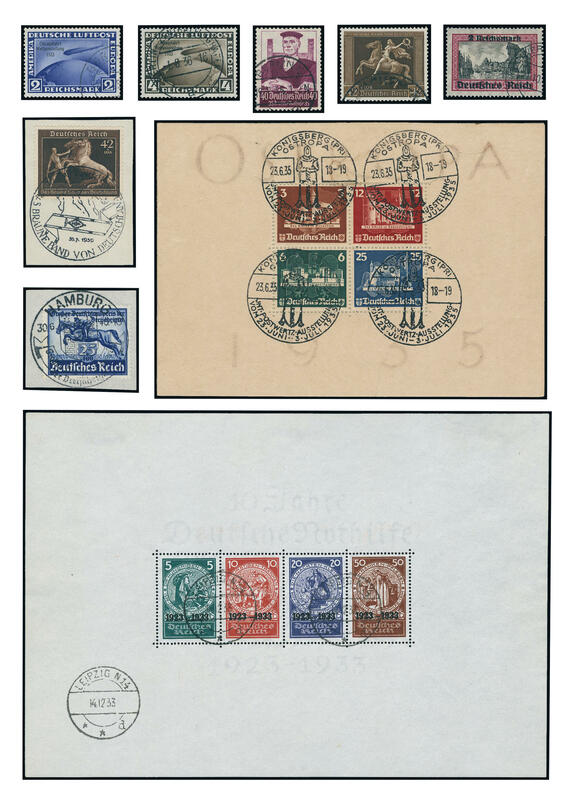 2597 ⊙/✉ German Reich - 1923 / 32, extensive used collection Weimar Republic, nearly complete with a lot of better issues, with also wood-pigeon 1924, airmail 1926, better help in need sets, I. A. A. 1927, 1-4 RM. Zeppelin, South America flight 1930, 1 RM. Polar travel, souvenir sheet stamps International Postage Stamp Exhibition 1930 and so on. Favorable! 2598 ⊙ German Reich - 1933 / 45, extensive used collection, nearly complete in the KA BE illustrated album. 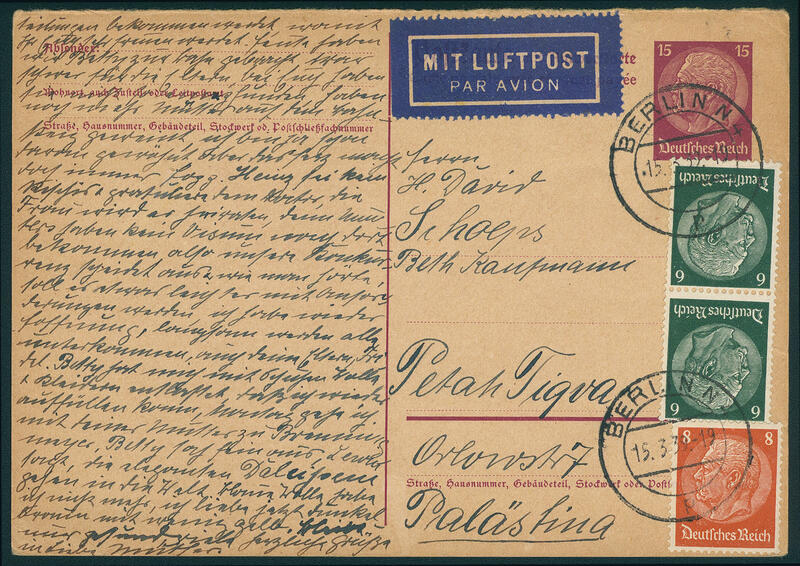 With also the scarce charity souvenir sheet in full original size neat cancelled \"LEIPZIG 14.12.33. \" expertized Peschl BPP, 2-4 RM. Chicago travel 1933, Ostropa souvenir sheet 1935 with four corresponding special cancellations, slightly mixed condition, as well further better issues, with also olympic games souvenir sheet pair, all Hitler souvenir sheets, winter relief series, brown and blue ribbons, Nürnburg-race, Gdansk farewell series and so on. Favorable opportunity to acquire one nearly complete collection!